This Chick-fil-A superfood salad copycat recipe tastes almost exactly like the original and is super yummy, super easy, and super healthy!!! Chick-fil-A is simply the best. The company and the food exemplify excellence, and I definitely find my car inching through the drive through more than I probably need to. Unfortunately, my order usually does not include this salad (which I prefer to make at home:-). If you love the Chick-fil-A superfood salad, you might want to bookmark this recipe now. It tastes almost identical to the Chick-fil-A version and couldn’t be easier to make. Better yet, this is a delicious and easy way to get a healthy side on the table that most everyone will eat and love. I actually posted this years ago but am sharing again since so many friends are looking for healthy recipes for 2019. You can definitely try the real version at Chick-fil-A, which they sell in small portions and in large catering sizes. What is in the Chick-fil-A superfood salad? 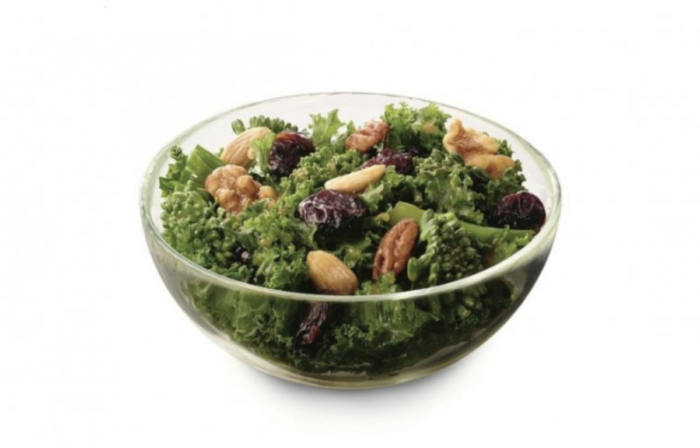 Description (per Chick-fil-A): Chopped Broccolini® and kale blend, tossed in a sweet and tangy maple vinaigrette dressing and topped with flavorful dried sour cherries. Served with our roasted nut blend. What is the nutritional content of the Chick-fil-A superfood salad? Nutritional info: 140 calories, 7 g fat, 2 g fiber, 11 g sugar, 16 g carbs, and 3 g protein, 80% vitamin C, and 45% vitamin A. What does the superfood salad taste like? The salad is served lightly coated in the vinaigrette which gives it a pleasantly tender texture. The nuts add a salty crunch and the cherries a sweet tang. It is a perfect blend of flavors and textures~sweet, salty, tangy, soft & crunchy. Below is a photo of the salad from the Chick-fil-A website. This salad is SO simple to make. Here is a breakdown of the ingredients and substitutions that work. Broccolini: Broccolini is a hybrid of broccoli and Chinese kale. It can be hard to find and is typically more expensive than broccoli. I’ve used both with great (almost identical) results. Kale: Bagged kale is easy to find. I try to find it pre-washed and well trimmed. Even the trimmed needs a bit more prep to remove tough stalks. Nuts: Trader Joe’s T.J.’s Cranberry, Almond & Cashew Trail Mix is a perfect nut blend for those who don’t want the added sugar of glazed nuts; this blend also contains cranberries. Cherries: Dried cherries are sweeter. I tend to use cranberries (pomegranate infused Craisins are wonderful). Maple Vinaigrette- This is a basic maple vinagrette recipe that is easy and delicious. As with any dressing, better ingredients yield a better result, so I use good quality maple syrup, Dijon, and EVOO. Make ahead: This superfood salad keeps well for 2-3 days in the fridge. Since it is vinegar based rather than mayo based, it makes a perfect lunchbox or picnic side. If you make this, I’d love to hear your thoughts! If you’ve had the real version, I’d love to hear how you think this copycat version compares. As always, thanks so much for stopping by. Wishing you a joyful, blessed and savvy day!!! This is my version of Chick-fil-A's yummy and healthy superfood salad, and it is almost identical! Trim broccolini or broccoli into bite size pieces. Chop kale into small pieces, removing thick stems. 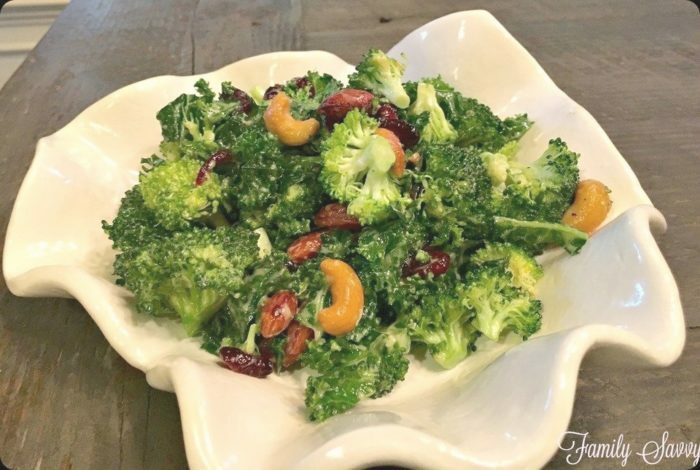 Toss broccoli, kale, nuts and cherries/cranberries into bowl. Keep refrigerated for up to two days. Whisk maple syrup, cider vinegar and mustard in large bowl (or in small food processor) until combined. Add the olive oil in a slow, steady stream until the vinaigrette emulsifies and thickens. Hi Chris! I use white wine vinegar or apple cider vinegar…..either is fab! Let me know how you like the salad!!!! What type of vinegar do you use in your maple vinaigrette? Hi Joyce! I am so glad you liked it! It really is quite yummy to be so healthy! Thanks for leaving a comment and for visiting Family Savvy:-) Blessings to you! I love this salad! My niece made this recipe for Easter dinner it was so good. I am making it today! Hi Carolina! I would keep this up to 4 days but after that, make a new batch. I always err on the side of food safety:-) Let me know how you like it!! How long are you able to keep this in your fridge after you make it? As a college student (always on the run! ), I love recipes that are not only easy to make but will also stay good in the fridge for more than 1-2 days! Look forward to trying your recipe! Thank you!! Hi Tobie! I’ll bet it was from the nuts. They have a sugary spicy taste to me also……. I swear I tasted a hint of cinnamon in my salad today. Hi Cindy! I think it tastes best about an hour or so after making it and chilling in the fridge. It is crunchy/tender and just perfect. The Chick version, which is softer, comes after about 2-3 hours in the fridge. Hope this helps! how far in advance should you make the salad before serving? I know chick fila makes theirs svery morning. Is it best to make several hours she’s of time so that dressing soaks into kale?? oh my goodness, i love this new salad at chick fil a and can’t wait to try this copycat!! Michele, I was so surprised and thrilled to see your name in the comments; I am thrilled you read the blog:-) We love the salad too! Hope you and your sweet family are well!! Keep in touch! I just made this and loved it! It’s super fast and easy. This is going to be a regular in my house now!